They remodeled their patio and it was beautiful! Welcome to this book of ideas! 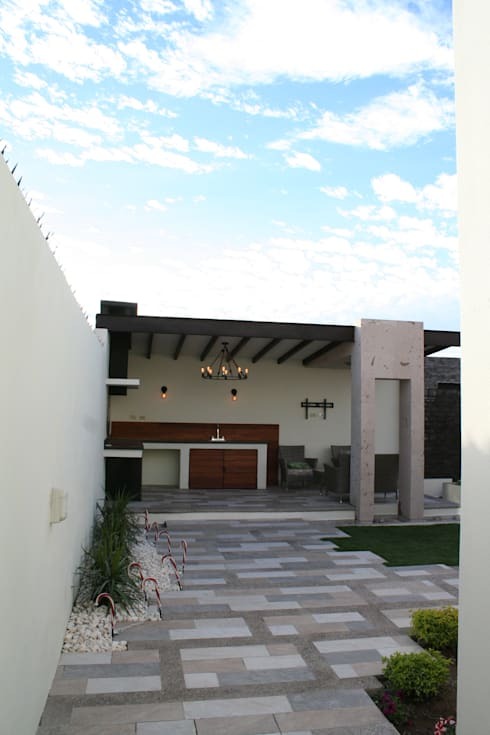 Today we bring you the before-and-after of a patio, through a constructive process that integrated a covered terrace with kitchenette, barbecue area, and living room, plus a large green area and two beautiful fountains or weeping walls cheering the place. In order to carry out a well-done, professional, and error-free work, teamwork and supervision are important. It is essential to maintain communication with the designer, either an architect or an engineer, and he or she in turn must maintain a direct and constant communication and supervision with their work crew. 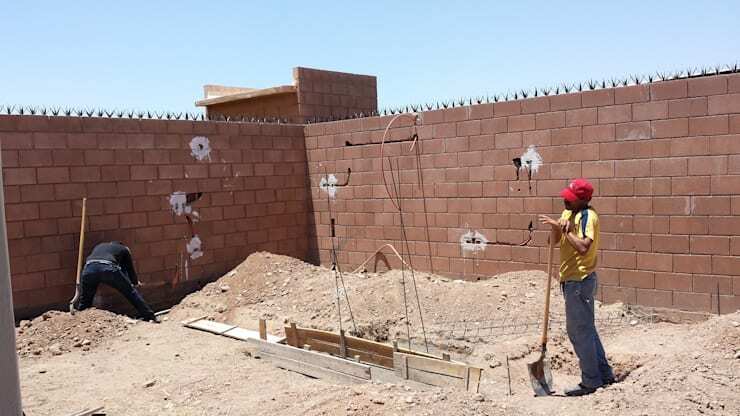 In this image we can see the work on the ground as they motion to build the foundations and the deflection of walls and slab. The walls are installed with electrical and hydraulic systems necessary for the space to function properly. Let's take a closer look: the kitchenette has a grill, a bar to prepare, a fairly wide countertop, bottom cupboard, and an extractor hood. The floor in grey tones looks splendid underneath the black and white design of the structure. 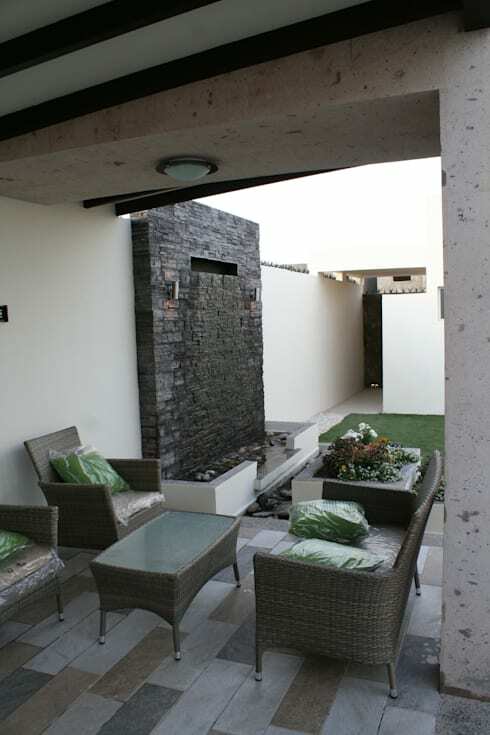 The terrace has a large space that also includes a small room, whose wall has the installation ready to receive a television. From above, patio that has everything! Don't you love it? 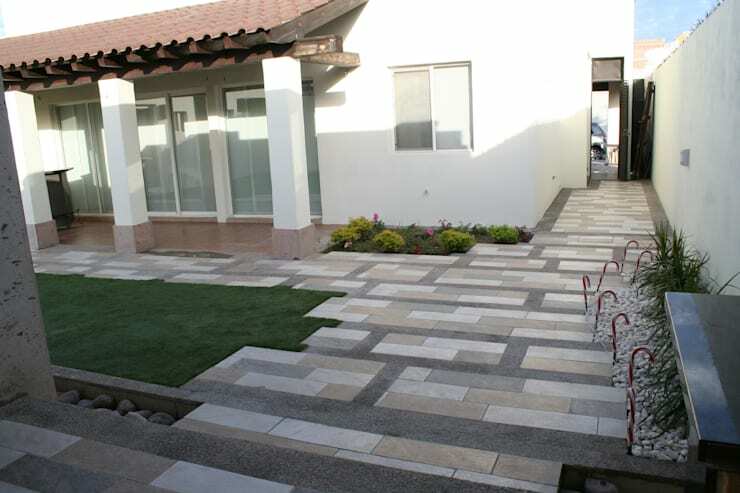 This is the patio that they were working on previously. Isn't it just wonderful? 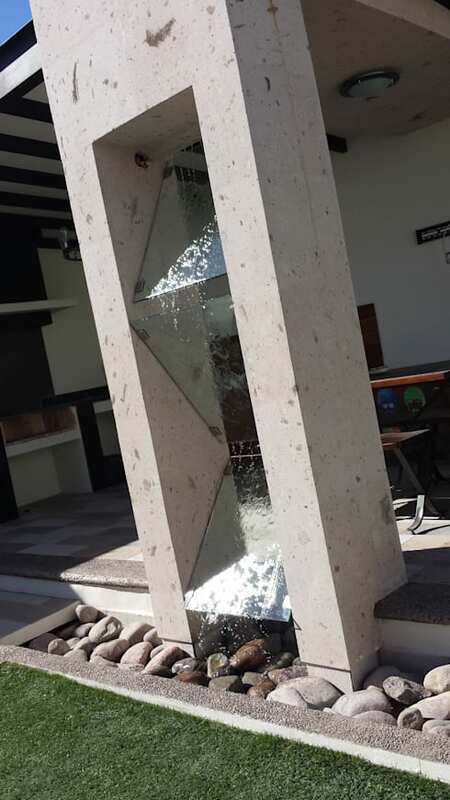 The area where the works were being done is now a beautiful covered terrace, which has a kitchenette, TV room, and is surrounded by a stone mirror with a fountain, planters, and a beautiful weeping wall. The living room is a fresh space with comfortable garden furniture in greyish tones, blending perfectly with the greys of the building. The green cushions give color and combines well with the garden. The weeping wall is beautiful! Next to the terrace is a fountain, known as weeping walls. It is a wall covered with slate stone, from which flows a curtain of water that drains to two beds of stones. 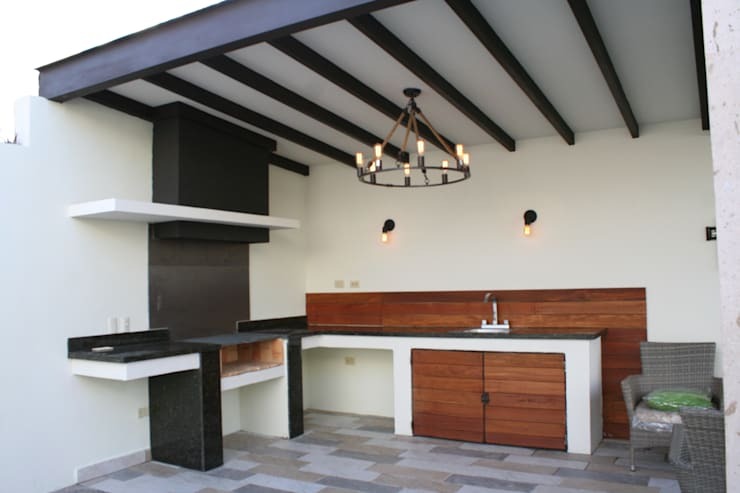 The rustic and yet modern charm is fascinating. 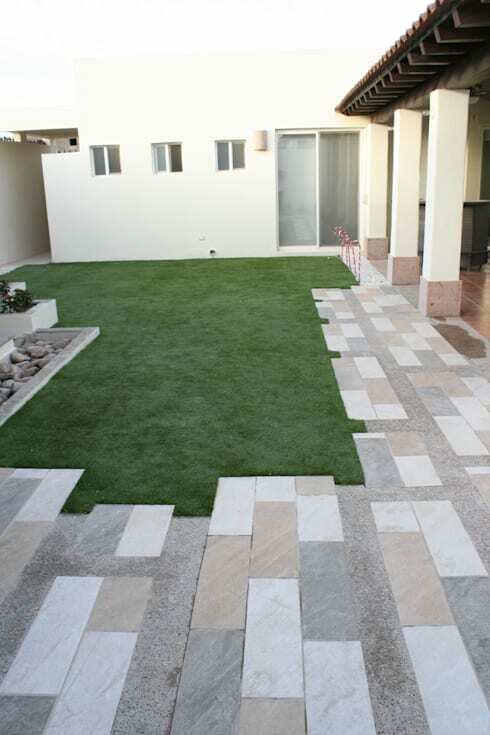 To the side, the patio has a green area, whose synthetic grass provides ease of maintenance without subtracting color and freshness, inviting to play or sit, even lying on the ground to take rich sunbathing. 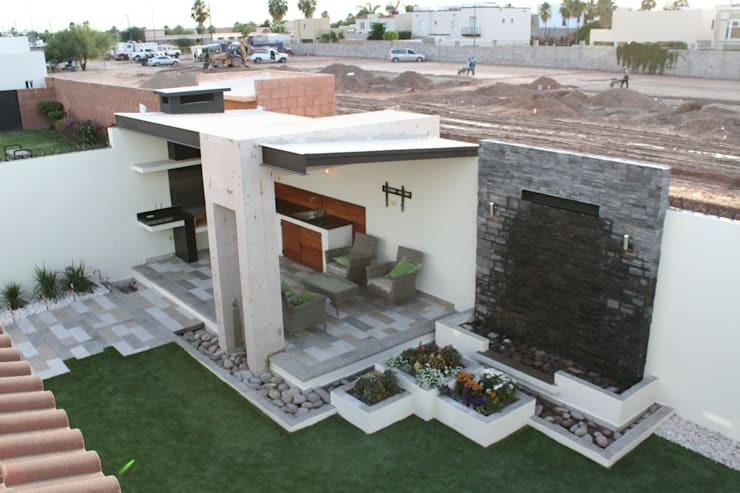 From the house, you can see the patio: spacious, modern, and perfectly distributed! And coming from the front of the house or coming out of it, this is the view you have of the new patio. You can appreciate the beautiful wooden gables under the white sky, the cool humidity of the weeping wall, and the comfort of the room. 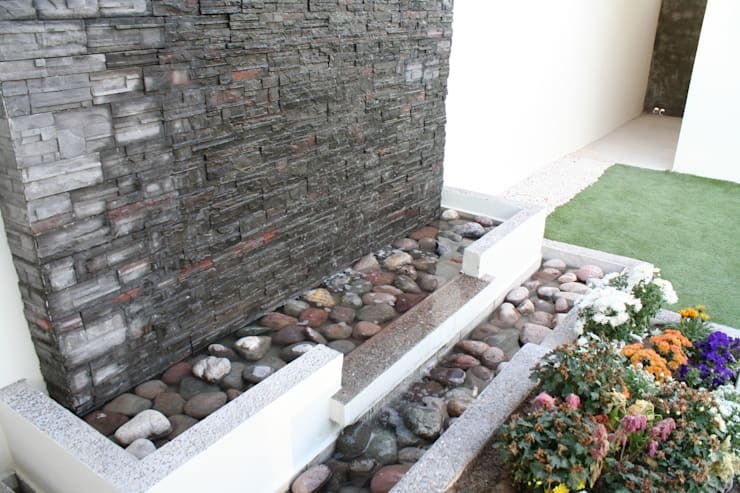 To the front of the patio is a small structure that is also bathed with a nice waterfall. 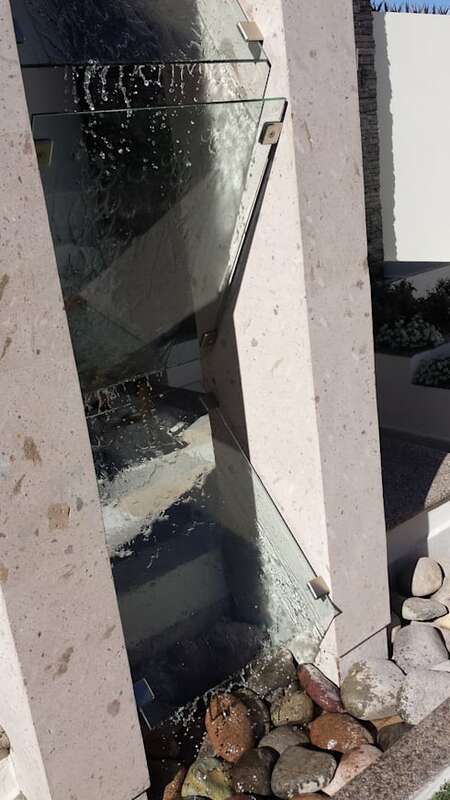 Only this time, it is by means of angled glass plates. We can see that the area connects to the house by means of a wide path covered in tiles of grey, cream, and beige. The house has a small terrace that connects the interiors by means of sliding windows. Definitely a cool and refreshing idea! We close our visit with a detailed view of this fountain. The bathed glass has a relaxing and refreshing effect on our senses, watching the water traces through the glass reminds us of the rains of childhood and children's games. Beautiful sensations for a beautiful place. 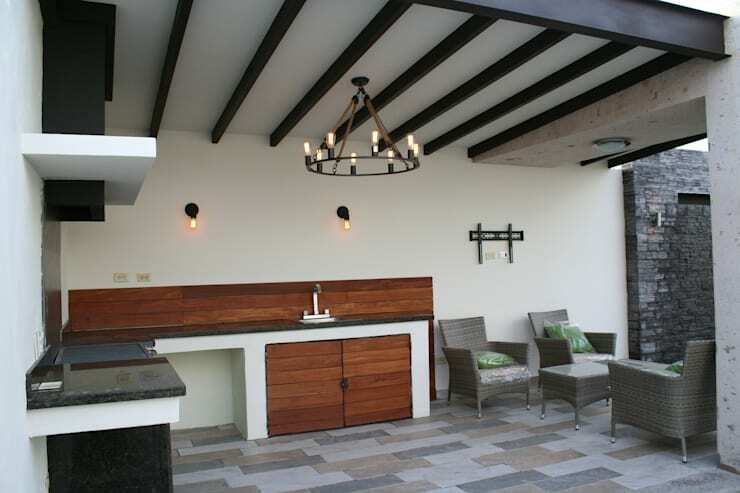 We invite you to read the 16 ideas of patios with wood on this link. What do you like most about this article? We'd love to hear from you below!